The Rhoose Cardiff International Airport train station is situated approximately 3 km from the terminal building and is on the Cardiff and Bridgend line. Trains run each direction every hour and a shuttle bus runs between the station and the terminal (free for passengers with a valid train ticket). An express bus service runs between the aiport and Cardiff city centre and Cardiff Bay every 20 minutes during the day and evening, 7 days per week. Additional Cardiff Bus service 95 runs via Barry on Monday to Saturday evenings. A taxi from the airport to Cardiff will cost 25 - 30 pounds. 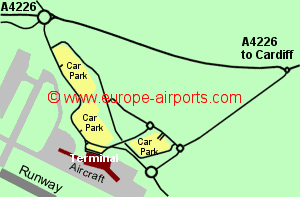 Short term car parking is located immediately opposite the terminal building and long term car parking is located with 400m. Cardiff airport has 5 bars/cafes/restaurants, 4 shops, a money changing facility, 3 ATM's and 2 business meeting rooms, Internet kiosks, and WiFi Intenet access (Free for 30 minutes). The 3 star Holiday Inn Express Cardiff Airport is adjacent to the airport. 1.4 million passengers passed through Cardiff airport during 2017, a 12% increase from the previous year.